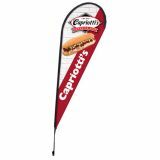 Custom Feather Flags fly and flap easily in the wind which makes it great attention getters! 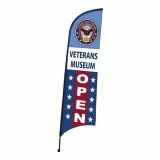 The vibrant colors and the generous imprint area will make it possible for you to place your logo and message in a bold and easily readable fashion even when these flags move with the wind. Feather flag not only have the flag benefit of flapping but also tend to be more cost effective. The simple design allows you to use any pole up to a 1-1/4" diameter. The simplicity of the design also reduces its price. All of our feather flags are made of the same nylon used in our commercial American flags to prevent premature fraying and fading inherent with the additional stress the feather flag endures over advertising banners. Choose the size of your Digitally Printed Feather Flags, send us your artwork in any form and we'll begin production as soon as your approve the artwork proof. 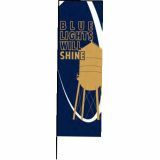 Tuff flags will offer you a superior, longer lasting custom flag at a lower price. 100% customer satisfaction guaranteed! CLICK HERE for Feather Flag Hardware. It's hard to believe something as inexpensive and basic as Feather Flags can drive traffic to your retail store. You've already done the work. You located your business in a retail location with traffic passing. Now take advantage of you location by standing out amongst the other retailers vying for attention. Feather flags offer you the benefit of flapping and flutter as a way of attracting on-lookers. They have the benefit of low cost and easy hardware. 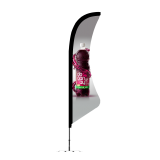 Put a set of Custom Feather Flags to the test and see what this easy marketing tool can do for your business. Tuff Flags offers the highest quality Feather Flags you'll find on the market, but also the best prices. Should you need any tips or custom design assistance, call us at our toll free number (888) 287-3524 or email us at customercare@tuffflags.com and our team will be happy to help you.